The National Gallery of Victoria on St Kilda Road has opened Triennial; a free exhibition that features the work of over 100 artists and designers from 32 countries. The exhibition is so immense that it stretches across all four levels of NGV International, the gardens and cafe included. This is quite overwhelming to cover in just one day, so we'd recommend you take your time and cover the exhibition over multiple visits, particularly if you're visiting with children. Speaking of children, the NGV Kids Gallery has been transformed into a wonderful hands-on space filled with a kaleidoscope of colour. This tactile exhibit has been designed by Dutch art collective We Make Carpets. Children are encouraged to craft their tapestries on the walls and the floor using pool noodles, ropes, felt & wooden shapes. You'll be hard pushed to get the kids to leave the Kids Gallery, so I'd recommend you head to other areas of the exhibition with them first if you want to save the best for last (best for the kids that is). Some of the artworks are of a political nature, although most of these are on the upper levels. 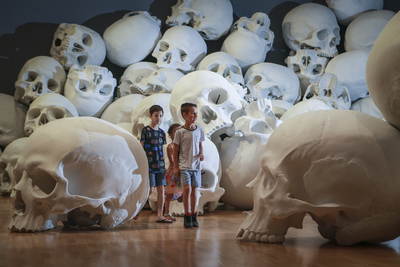 One such exhibit is "Mass 2016-17" by Ron Mueck, which sees 100 oversized fibreglass and resin skulls sit in a room filled with the NGV's 17th and 18th century European paintings. Some might find his work disturbing, but the KidTown Melbourne crew found it fascinating! "Whoa" factor guaranteed. Although it's near impossible to choose a favourite piece of artwork, KidTown Mr.9 enjoyed the "chair room" as he called it. 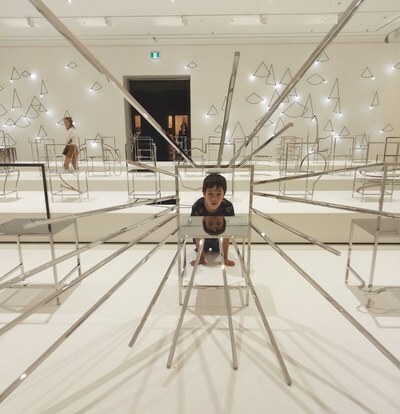 This large white is filled with metal Manga chairs by Nendo, which translate traditional graphic forms from Japanese manga comics to furniture design. 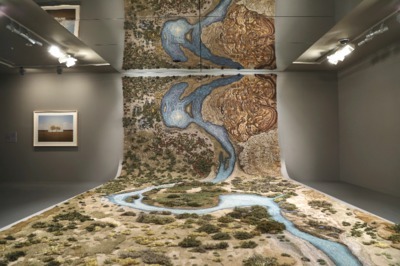 The children also loved running and rolling around on the beautiful hand-tufted rug and tapestry "Santa Cruz River 2016–17" by Argentinian artist Alexandra Kehayoglou. One of my favourites is Japanese artist Yayoi Kusama's 'Flower Obsession" installation. Visitors are given a red flower sticker and asked to slap it anywhere they like. Imagine how this faux apartment will look toward the end of the exhibition in April? Looking for something to do with the kids in the summer school holidays? Look no further. 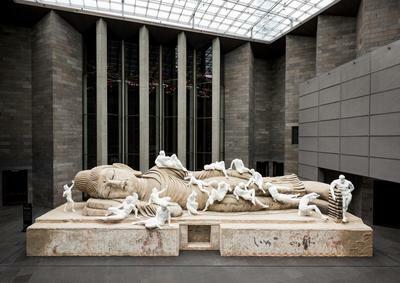 NGV Triennial will keep all of you entertained, and it's completely free to enjoy. 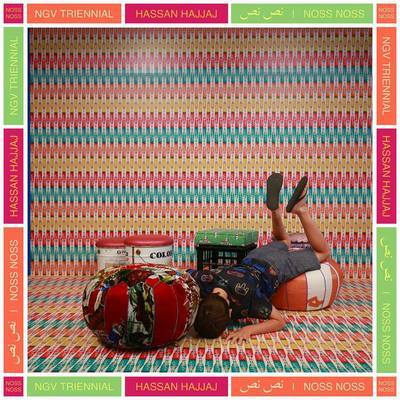 Don't forget to snap a souvenir photo in the Noss Noss Studio found on the ground floor in NGV's Cafe, which has been transformed into a Moroccan tea house designed by Hassan Hajjaj.